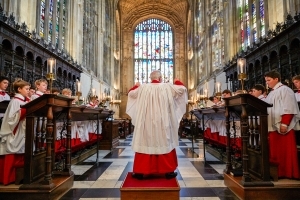 Choral Matins in King’s College Chapel on Sunday 13 May, including the annual Semon before the University, has been released as a webcast on the King’s College website. This unique occasion in the Cambridge year derives from the annual ‘Lady Day’ sermon, the requirement for which was written into the Founder’s statutes. This was ‘Foundation Day’, an occasion when the dedication of the College to its co-Patron the Blessed Virgin Mary was recalled and celebrated with a sermon ‘to the University’ by ‘one of the Society’. Preached for hundreds of years on Lady Day itself, March 25th, the first day of the year in the calendar being used when the College was founded, it moved away from Lady Day in the second half of the twentieth century and is now preached in Full Easter Term on the Sunday after Ascension. The preacher this year was the Master of Peterhouse, Bridget Kendall. Bridget had a famously distinguished career with the BBC, for many years being in the senior role of Diplomatic Correspondent. She has a particular expertise in Russian affairs, and has interpreted both the Cold War and all that has unfolded since the days of glasnost to the western world. She has interviewed many of the most important and powerful global leaders. Her intellectual awards include two honorary fellowships in Oxford Colleges and three honorary doctorates at different Universities. The service, which is available to listen to in full, also features the magnificent Verdi Te Deum, Benjamin Britten’s Jubilate in C, and God is gone up by Gerald Finzi. You can listen to the webcast on the King’s College Website.